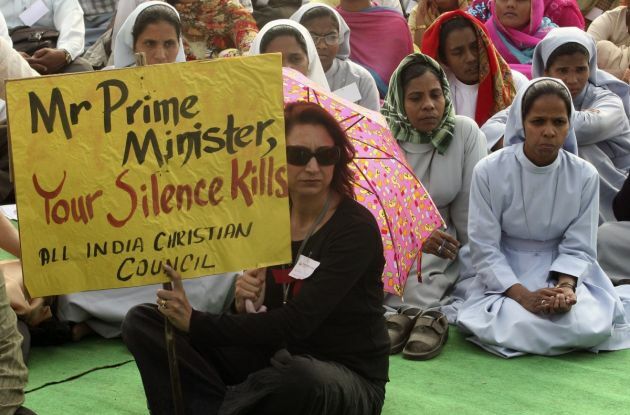 (Photo: REUTERS / Ajay Verma)Christians take part in a protest against the recent killings of Christians in Orissa and Karnataka, in the northern Indian city of Chandigarh November 20, 2008. Protesters demanded security and justice for their community in Orissa and Karnataka, according to a media release. Life is becoming a nightmare again for many Christian communities in the Indian state of Orissa, scene of the worst anti-Christian persecution in India's history in 2008, says a national Christian leader. Sajan George, president of the Global Council of Indian Christians (GCIC) said that some parts of the state, many Christian families have seen their newly-rebuilt homes destroyed, the Roman Catholic AsiaNews has reported. Extremists, said to be ultra-nationalist Hindus, have driven many Christians from their villages, forcing them to give up water, property, and other essentials. George spoke to AsiaNews about new acts of "intimidation and persecution against Christians," noting that the situation has been "made worst by the complicity of local police and administrators." In August 2008, Christians in Orissa, especially in Kandhamal, 250 kilometres (150 miles) from Bhubaneswar, said they had faced what they describe as orchestrated attacks by Hindu mobs, since the killing of Hindu leader Swami Laxmanananda Saraswati in August. A Maoist leader was reported to have claimed responsibility for the killing but some Hindu groups said it was a Christian conspiracy, as the 85-year-old slain monk had been campaigning against conversion to Christianity in Kandhamal, where he was based. More than half the 100 000 Christians in Kandhamal were left homeless as a result of the extremists roaming villages, and trying forcibly to convert Christians to Hinduism, whilst looting and torching Christian houses. George said on May 3, that the Global Council of Indian Christians wants the government to treat the victims of anti-Christian pogroms in Orissa the same way as it has treated survivors of the riots between Hindus and Muslims in Gujarat in 2002. GCIC president George said he wants the government to give "the same concessions to those who suffered from [anti-Christian] pogroms." In particular, he cited "the children and dependents of victims of anti-Christian violence that occurred in the district of Kandhamal (Orissa) in 2008." "Besides suffering persecution on religious grounds, these people belong to the most marginalised groups in society since most of them are Dalits [who were once classified as 'untouchables' under the caste system] and tribals," Sajan explained. The Christian leader said that what happened in Kandhamal in August 2008, "is without a doubt the most painful and terrible chapter in the history of India. Innocent Christians were brutally targeted and mercilessly killed. Their homes, places of worship and places of work were destroyed. The wounds of that terrible tragedy cannot be easily erased."